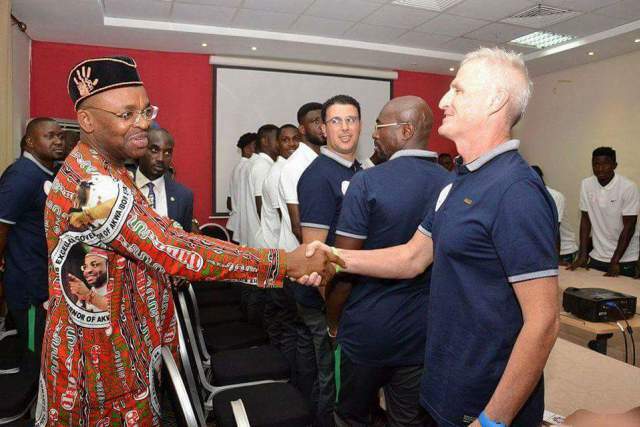 Governor Udom Emmanuel of Akwa Ibom who pledged $10,000 per goal for the 2018 World Cup qualifying matches against Cameroon on Wednesday redeemed his pledge. Governor Emmanuel made the pledge two days before their clash with the African champions, and the Eagles did the job by thrashing Cameroon 4-0 in Uyo before drawing the second leg 1-1 against the indomitable Lions three days later in Yaounde. On Wednesday, the football-loving Governor and a great host of the Super Eagles in this qualifying campaign said there is more where the money came from if the team earns a sixth FIFA World Cup appearance by winning on Saturday. “I know you have the quality to overcome in this important match, but I don’t want you to underrate your opponents. I love the professionalism and dedication to the cause that you have shown since the beginning of this qualifying campaign. Those efforts have put Nigeria at the top of the table. Super Eagles will not disappoint on Saturday.